← Gardens and Bird Feeders and Bread Crumbs, Oh My! Your friendly dog has gone missing and there is a good chance that he has ended up in an animal control facility or stray holding facility. This article will help you understand how the system works and will help maximize your chances of locating your dog. Remember though, that every state has different laws and procedures, so you will need to familiarize yourself with your local area. Dogs are considered property in all fifty states and most states have some sort of “Stray Hold” law that is designed to give an owner a chance to reclaim their dog. This may be as short as three days or as long as seven days. Most municipalities will assign a “stray contract” with an entity in their community to house the “strays” until the owner reclaims them. These are the ONLY facilities that should be housing lost dogs. Rescues should not be accepting or housing lost dogs unless they hold the contract for your area. When they accept lost dogs without the contract, it adds another layer of confusion to the system, and is one more barrier to getting lost pets back home. Many different terms may be used to describe facilities which also adds to the confusion. It may be called the pound, an impound facility, a stray holding facility, an animal control facility, an animal shelter, or a humane society. It may have SPCA attached to the name, although this does not mean it is connected with the national organization, the ASPCA. 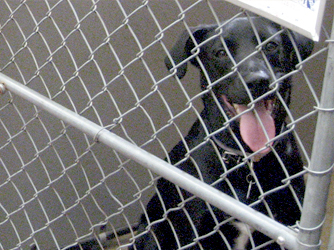 Vet clinics, boarding kennels, town offices and police stations may also house lost dogs. Stray holding facilities may be a private business, a non-profit organization or a totally government run organization. Regardless, the animal control contract is paid for with tax payer dollars that compensate the facility for impounding and housing your dog while he is lost. You have a right to know how your tax dollars are being spent and how the system works! These services are also subject to Freedom of Information Act (FOIA) requests if you run into problems. The stray holding facility can be an elaborate large central animal shelter with all the bells and whistles of modern technology. These facilities may also operate as a humane society and will adopt your dog out if you don’t reclaim him in time. Or, it may be a garage or small kennel on the back of somebody’s property. The stray contract may be held by somebody that doesn’t have a cell phone or microchip scanner; let alone a computer with internet service to help get the word out that they have your dog. It is your responsibility to advocate for your lost dog and make yourself aware of all the different stray holding possibilities in your area. Check with your local town offices and police and sheriff’s departments for a list. You will want to expand this, as time lapses. Your dog may being held several counties away and you will only have a very short time to locate and reclaim him. Leave no stone unturned! Dogs that come off of “Stray Hold” are either made available for adoption at the facility, transferred to another rescue or shelter for adoption, or euthanized. We cannot stress enough that time is of the essence and you may want to enlist some friends or family to help you scan the websites, make the phone calls necessary and personally visit all of the facilities in your area. Don’t limit yourself to your county. Remember, dogs walk. They can easily end up in another county, state, or jurisdiction and sad to say, there is not any internal cross-sharing of information between the facilities. Just because you file a lost dog report at one place, doesn’t mean that they share it with the others. In fact, that rarely happens, if at all. It is not uncommon for there to be dozens of stray holding facilities in one county and you will need to check them all! This lack of information sharing has been the biggest hurdle for the lost pet problem. There isn’t a “central clearing house” for lost pets, like there is for lost children. There are many reasons for this, and it is something that the animal welfare world will need to work towards if shelter deaths in this country are going to decline. The most progressive facilities will post pictures on line or on their Facebook page as soon as the dog is turned in. This has become an invaluable tool for locating owners and saving lives. Some shelters even have volunteer “lost and found matchers” who will try to match up lost dog reports with dogs that are brought in. But again, this is more the exception, than the rule. Shelters that don’t post pictures on line may adopt out your dog immediately after the Stray Hold has elapsed. You may never know that your dog was there unless you check the “adoptable” photos. These adoption pictures should appear on their website or on Petfinder.org once the dog is up for adoption. But please be forewarned, if your dog is friendly and adoptable, it may only be on the website for a few hours or a few days. If a shelter adopts your dog out, you will not have any recourse unless you are prepared to hire a lawyer and begin a legal battle. If your dog is old, injured or sick, or shows any kind of stress or aggression in the shelter, (even if it is only from fear), he may very likely be euthanized immediately after his stray hold is up. This is especially true of larger dogs in the larger urban shelters. Right now, it is too easy for a shelter to proclaim that “the owner wasn’t looking for their dog” and euthanize it or adopt it out immediately after the stray hold period has lapsed, instead of proactively being part of the solution. This is something that we struggle with every day and you can help us by educating the public about this very serious void in the animal welfare system. Check out EVERY dog that you think is a possible match for your dog. Errors can be made regarding gender and age; microchips can be missed and breeds can be mis-identified. Even when you go and check in person, don’t be surprised if your dog doesn’t know you or doesn’t exhibit specific behaviors that you would expect to see. The stress of the shelter may make your dog “shut down” and you may overlook him. Please be careful. We are aware of several “near misses” when an owner didn’t recognize their own dog. Don’t delay, get started now because your dog is depending upon you! This entry was posted in Friendly Lost Dog Strategies, Rescues and Shelters, Shy Lost Dog Strategies and tagged central database. Bookmark the permalink.